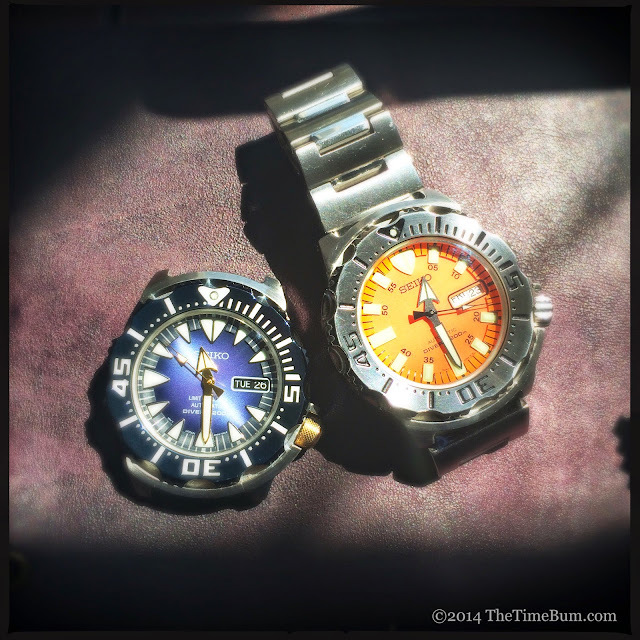 In my last review, I told you about the Seiko SKX781 Orange Monster, concluding that it was awesome. 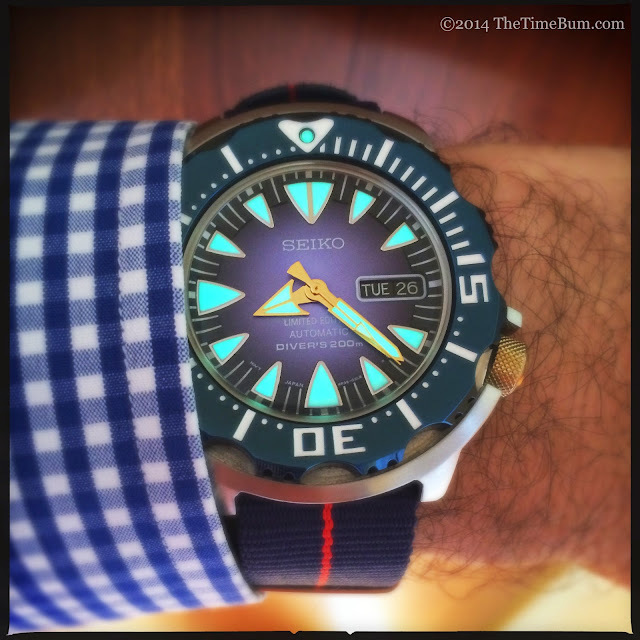 Launched in 2000, the Monster series divers have had a good run, enjoying cult-like status in the affordable watch community, but in 2013, Seiko decided to shake things up by releasing a updated version of the line. Is the new model a cut above, or merely a pretender to the throne? The Time Bum would be remiss in his duties if he did not find out. Lucky for all of us, local enthusiast and Instagram member @itewk had a brand new one that was willing to lend. 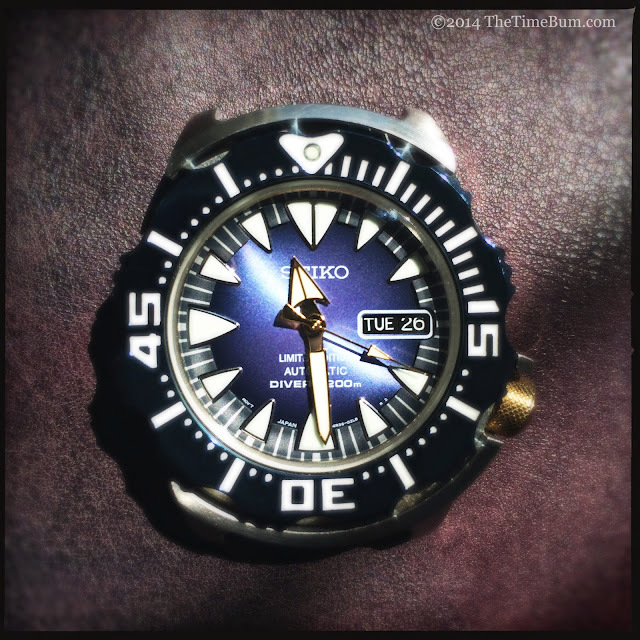 Better still, it was one of the limited edition SRP455 Blue Monsters, created in honor of Seiko's 100th Anniversary. I'll just start with the glaringly obvious. The watch has a blue bezel and dial. Not just any blue, but a magnificent dark Cerulean, with a glossy finish on the dished and scalloped bezel and a sun ray effect on the dial that appears to fade lighter towards the center. Bezel markers and numerals are filled with lume, the high contrast white-on-blue is stiking and easily legible. A sloped chapter index graces this dial just like to last version. It seems Seiko took the "Monster' moniker to heart and gave the new version slightly rounded triangle darts that resemble fangs. It may sound silly, but these applied markers actually look great on this model (on the black and red "Bloody Monster" version, not so much). In another divergence from the original, Seiko has excised the numeric index that was previously on the inner part of the dial. After comparing the two, I approve of the change. Overall, the dial is cleaner. The hands are the same arrow shape as before, finished in a polished gold tone. Gold may seem a bit dandy for a tool watch, but against the rich blue, it works, providing some attractive detail without going over the top. The dial proudly proclaims its "Limited Edition" status. The case appears identical to that of the original Monster, and loses not a whit of utility. It retains the 41.5x12mm dimensions,120-click unidirectional bezel, the familiar partial bezel shroud, and the slightly domed Hardex crystal. The "Diver's 200M" on the dial and cast Tsumami case back decoration prove it has retained the coveted dive watch certification as well. 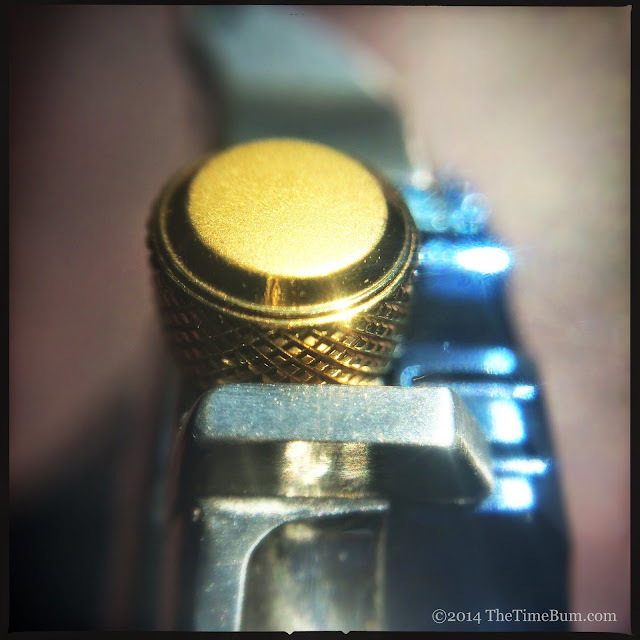 The screw down crown is once again in the 4 o'clock position, and while it is still not signed, it is now knurled. On this model, it is also gold colored, coordinating nicely with the dial accents. The most significant change is under the hood, where a 4R36 automatic movement ticks away at 21.6k bph. This is a new version of the old faithful 7s26, but with 24 jewels instead of 21, and with the addition of hacking and hand winding capability. This improvement addresses the biggest gripe about the old movement and increases its functionality. 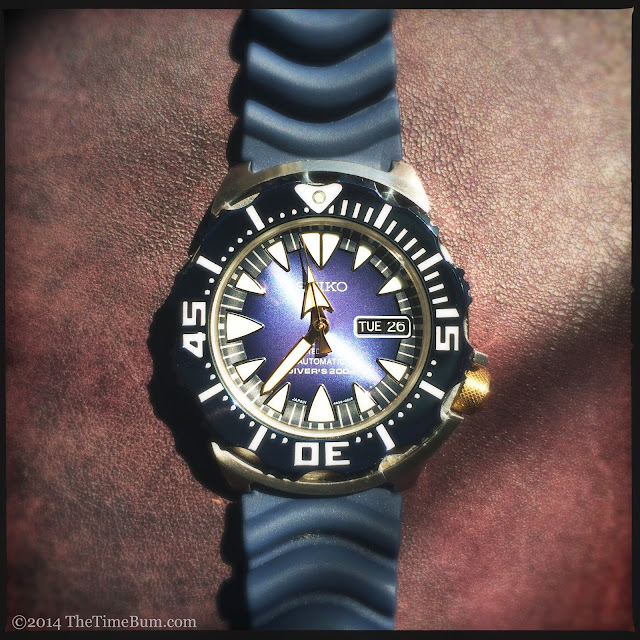 The SRP455 arrived on a blue 20mm rubber strap in Seiko's usual vented dive watch style. 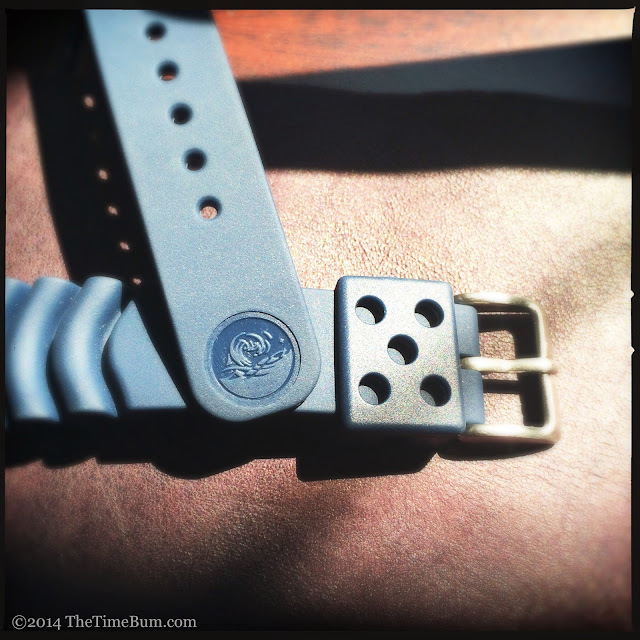 The strap is a good fit for the watch, complementing the blue on the bezel and dial. It does not, however, fit my wrist. It measures a lengthy 140/80mm, the rubber is stiff, and the tail curled almost comically around my wrist, bobbing past the last keeper in an undignified fashion. This might be handy if you are strapping it over a wet suit, but frankly, it seems a bit short for that. Whatever the intent, I could not wear the thing. Once I had my pictures, off it went, replaced by a NATO. I think a bracelet would be best. The 455 does not come with one, but the other models do. It appears to be the same one as the old monster, which was great, although I could not confirm this first hand. A bracelet would look correct on this watch and would be a huge improvement over that strap. Now how about that lume? The original Monster set a high bar for luminous paint. To see if the new one measured up, I retrieved my Portable Ultraviolet Recharging Device (flashlight) and retreated to the Illumination Testing Center of Time Bum Laboratories (closet) to find out. According to my highly scientific test, the LumiBrite on the new Monster is just as strong as the old, or near as makes no difference. The photo below was shot after just a few minutes in sunlight. 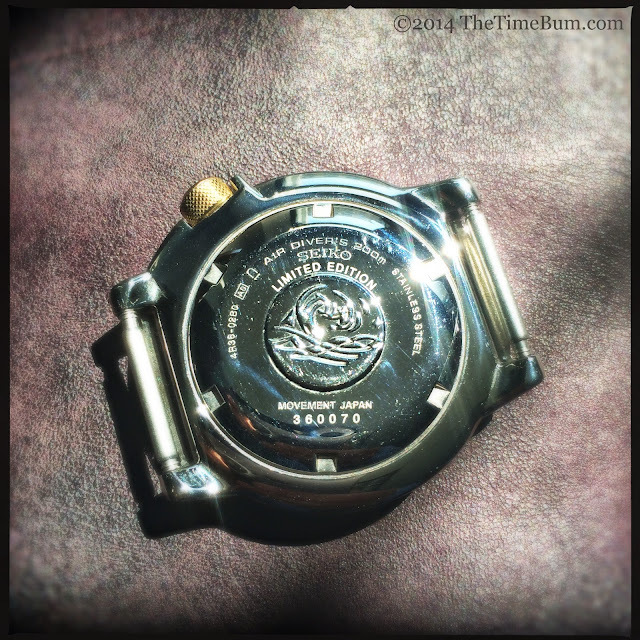 The Time Bum does not dive, but @itewk does, and has taken this watch with him. He reports that it functions just as easily under water as it does on dry land: the bezel can be operated with gloves, the lume is bright, and the blue color remains clearly visible. This last bit is an excellent rationalization if you must have the SRP455 as the color blue is the least absorbed by water, and can be seen by the human eye at greater depths. If that does not do it for you, then just buy it because it's pretty. The SRP455 has an MSRP of $495, and owing to it's limited edition status, seems pretty well fixed to stay there. My Internet sleuthing turned up only a handful, and all were selling for full list or above. If you can resist the lure of the blue, you will fare better. 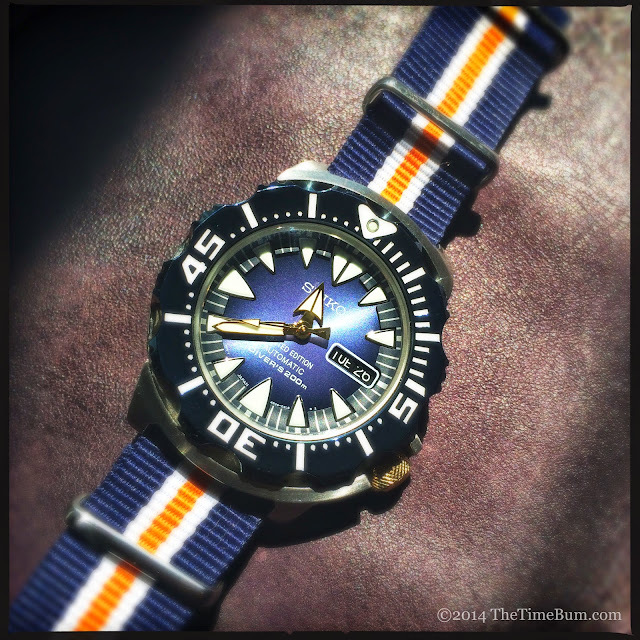 I found the SRP309, the new Orange Monster, for around $200 on a bracelet, right in line with the previous model. I thoroughly enjoyed my time with the Blue Monster, and I think it is safe to say that Seiko has done right by the name, creating a worthy successor to its cult classic. Pro: Everything we loved about the original plus an improved movement. Con: Limited edition is pricy. Sub par strap. Sum: Blue looks amazing, but standard editions are a better buy.